Roses, day lilies, Black-eyed-Susans, phlox and lavender are everywhere…I’m crazy about them! Gathering roses to bring inside, such a treat to make little fragrant bouquets to sit on tables throughout the house…walking from room-to-room allows me to detect a deliciously differing scent from each little bundle of vintage blossoms. 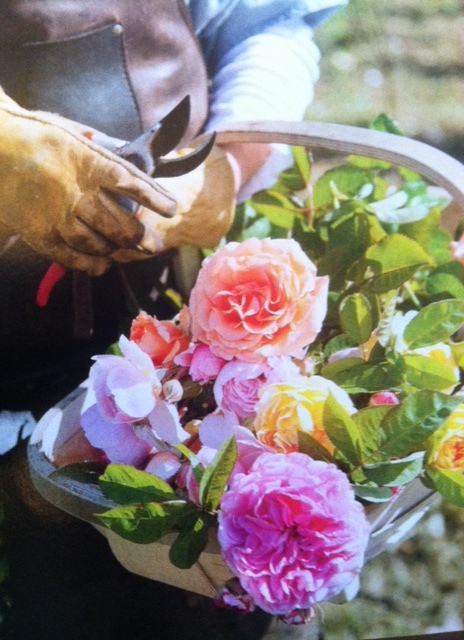 While strolling the garden, I always carry my sturdy handmade English trug for holding flowers and my clippings are done with the FELCOs as shown…and leather rose gloves! Happiness isn’t being cheerful all the time: it’s being interested in things…finding out more about something, learning how to appreciate something better, incorporating SOMETHING NEW that fits with what you already have. Walking through parts of my garden, the rhythm changes just as the butterflies flit: some areas feel somewhat controlled, while in others the plant groupings wave, flow and flutter! This cottage-style garden is a wonderful habitat…these old-fashioned flowers are pollen and nectar rich which attract birds, bees, butterflies, hummingbirds, and many beneficial insects…along with a few pesky critters as well! But there is enough to go around for all…Everyday I discover a new visitor, even if it is a tomato horn worm on my holly of all places…I just pick it off and put it on the bird screen feeder! The hummers empty the feeders so fast I have to fill them with clear sugar-water everyday. I just keep a container of my homemade “nectar”in the fridge so I don’t have to boil water and make the syrup as often as they drain the window feeder. For rose sugar I use my dried organic rose petals mixed into white organic sugar. For lavender flavor I just mix dried buds into the sugar. For vanilla, a real bean in the jar is all you need…and it lasts for years. 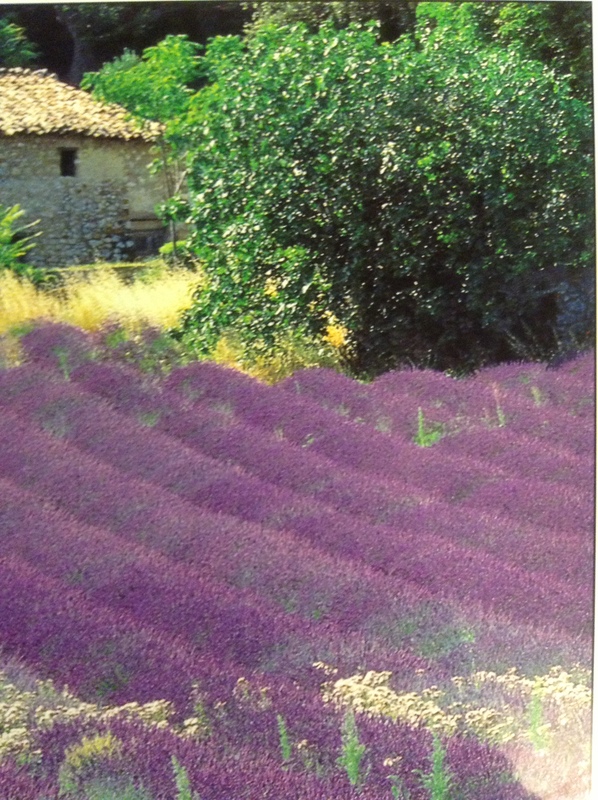 So by now, you all know how much I LOVE lavender…the planting and growing, the garden filled with blooms abuzz, the harvesting…and, the exquisite fragrance. AND, you also know from previous posts how I use lavender to clean, to bake, to flavor lemonade…in sachets as a moth preventative and drawer scent. There are so many uses for lavender in its various forms…but one I really enjoy at least twice a week…soaking my feet in warm water along with some crushed lavender stems and a few drops of lavender essential oil. Another good practice for me…keeping a small pillow on my bed, filled with lavender buds…this aids in relaxation and usually helps me to drift off to sleep. READ THIS IN A EUROPEAN MAGAZINE…to clean a bottle or jar having been used to store oil or a greasy liquid, fill it with some WARM coffee grounds, add warm water. Let sit for a while, then shake well…pour this mixture on shrubs or compost pile instead of in trash…reuse, recycle! Next Article ALFRESCO…or, in the open air.